The Community Initiatives program is open to incorporated, tax exempt, 501c organizations residing in Austin or its Extra Territorial Jurisdiction. Individual artists and other unincorporated organizations may apply under the umbrella of a 501c organization. Project activities must involve the marketing, production, presentation, and funding of a public performance or exhibition open to both residents and tourists. Application Workshops are held on the first Thursday of each month at 12pm at the Cultural Arts Division Offices. Please visit our Events Page for dates and to RSVP. For a list of organizations that have been awarded funds for FY 2018, click here. Community Initiatives applications will be accepted on a fixed quarterly basis during the Cultural Arts Funding Program fiscal year, while funds are available. The proposed activity date will determine when you will need to apply. The application due date is based on a fixed quarterly schedule. The first event date must fall within the quarterly project schedule. Please days prior to the project start date. Applications are accepted based on the date of the proposed event. Please use this chart to determine when to submit your application. The deadline has passed for events beginning in: OCTOBER, NOVEMBER OR DECEMBER 2018 or JANUARY, FEBRUARY or MARCH 2019. The deadline is JANUARY 28, 2019 at 11:59 PM. The deadline is APRIL 29, 2019 at 11:59 PM. The FY19 Community Initiatives Guidelines have changed significantly. Please review the FY19 Major Changes Document and the complete program guidelines before starting your application. YOU MUST RECEIVE AN INVITATION FROM YOUR FISCAL SPONSOR BEFORE YOU BEGIN YOUR APPLICATION. Your fiscal sponsor MUST complete Section I. Summary for you. They will then invite you to be a “collaborator.” Once you receive the emailed invitation you may begin completing Section II. Eligibility. If you begin the application without an invitation from your fiscal sponsor your application will not be accepted and you will have to start your application over once you receive the invitation from your fiscal sponsor. NO EXCEPTIONS. If you or your fiscal sponsor have questions, contact Anne-Marie McKaskle-Davis, 512-974-7854 or Peggy Ellithorpe, 512-974-7978. Click here to Begin Your FY19 CI Application. If awarded CI funds you must complete the Mandatory Orientation below. Please contact us if you require a logo file in a different format. Note that your name and address in the Vendor System must match exactly to the name and address in your online application, or payments cannot be processed. Final Reports are due within 30 days of completion of the contract period or activity rounded to the end of the month. 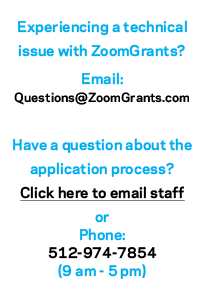 All final report materials can be accessed through your ZoomGrants® account online in the Final Report tab. It is mandatory to attend a Final Report Workshop annually. See our complete schedule of workshops here and plan to attend one before your Final Report is due. For FY 2015, the City of Austin has allocated $7.9 million in cultural arts funding.